Hot off the presses at Gencon Star Trek Panic was grabbed for me by a mate heading over there. I’m not usually one for seeking down games in this manner but in this case the game may never be easily available over here due to some weird licensing issues. Anyway on with the review! Look at that thing! Ain’t it cool! 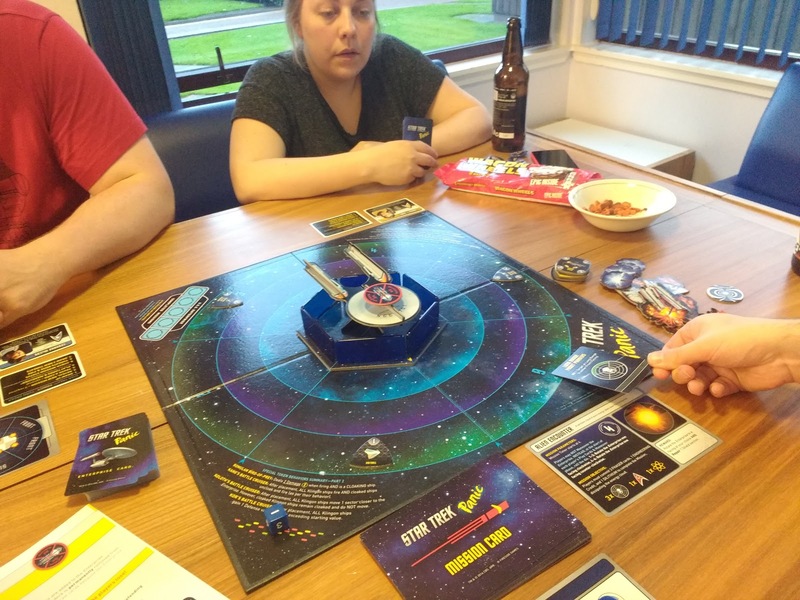 Star Trek Panic sees you and up to 5 buddies crewing the original series Enterprise through 5 different missions whilst fending off attacks from Romulans, Klingons and pesky Tholians. Do this before the Enterprise explodes and you win! Each mission has a different requirement for completion: maybe you’ll have to survive a Klingon attack or do some research into a strange ageing disease. Either way the core of the game comes down to the cards you play. On a players turn they do draw up to their hand size, maybe trade a card with someone else then get down to the nitty gritty of flying the Enterprise around and dealing with the Mission and Threats that are on the board. Cards allow you to phaser or torpedo threats, commit resources to missions, repair your ship (it’s going to need that a lot!) and do other special things depending on the card. Once you have played cards, as many as you want, you see if the missions is complete, move the threats about and draw some new ones. Threats constantly encroach upon your ship, mostly starting at long range and then flying towards you, gradually phasering you to death. The threats are a bit varied as well, but I won’t spoil the surprises! Once they take down your shields they can shoot at the ship directly and even board if they get too close. As you take damage you put awesome tokens on the shields and the ship that just makes everything feel really dynamic, I mean just look at this! It’s a pretty simple co-op game but that doesn’t mean it’s not fun. 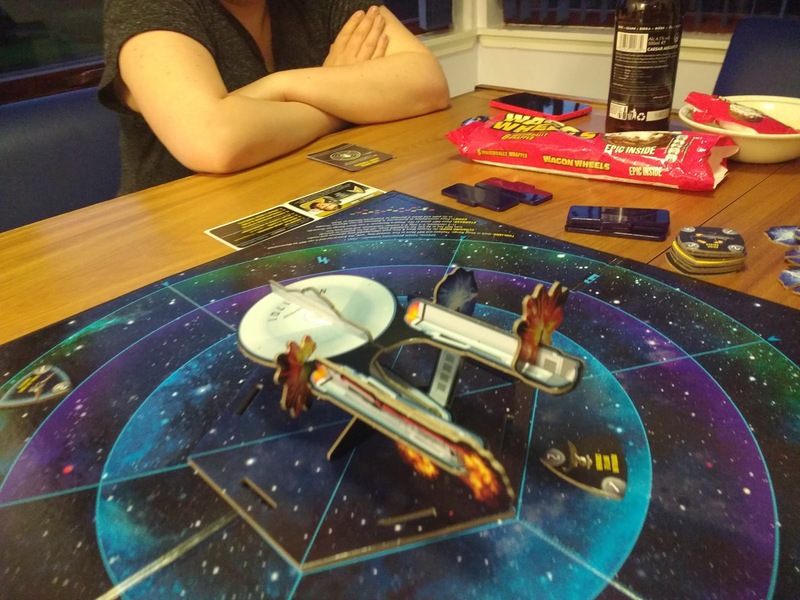 The game feels great with the awesome model of the Enterprise in the middle taking damage with the fantastic cardboard explosion markers making it feel really threatening and that you are in a lot of trouble. I love the plastic shield barriers that protect you initially as well, could have just gone for cardboard but the slight transparent plastic just feels right. The missions are nicely varied and the constant build of the threats round your ship make you feel under pressure. We were pretty beaten up by the end of our first playthrough but we made it, just, which is exactly what I want from a coop game. There is a good amount of replayability in the game and I can see this one staying in my collection for a while as a good light coop game. If you can get your hands on this one I thoroughly recommend it.